Does Making Registration Easier Cause More Voting? In this year’s session of the General Assembly, Democrats will be introducing legislation providing for automatic registration of voters. While the details vary between proposals, the concept is that state agencies would proactively “forward to election officials data about anyone who meets the age, residency and citizenship criteria to vote.” Individuals would be allowed to opt out if they wish. Democrats clearly believe this would increase the number of voters who support their party. Republicans also believe that since they are openly opposing the idea. Are they right? Would more registration lead to more voting? The State of Maryland has taken many steps to make registering and voting easier, including early voting (2010), online registration (2012) and expansion of early voting from six to eight days (2013). Same day registration during early voting will be in effect for the first time in 2016. The state has also offered applicants for driver’s licenses the opportunity to register as voters in conformance with federal law since 1995. Maryland has seen steady increases in voter registration over the years. The graph below shows statewide registered voters in both primary and general elections since 1990. While there are slight variations in individual cycles, registration has gone up by about 4-5% every two years. Has that resulted in more voting? Much has been made of declining turnout in the past, and there is something to that: the turnout rate has fallen from 61% in the 1994 general election to 47% in 2014. It has also declined from 81% in the 1992 general election to 74% in 2012. But looking at the turnout rate alone can be misleading. If the number of actual voters increases at a slower rate than the number of registered voters, the turnout rate can fall even if actual voting rises. In fact, if more aggressive voter registration outreach brings in voters who are less likely to vote, that is exactly what could happen. The test here is whether actual voting is going up along with registration. First, let’s look at primaries. 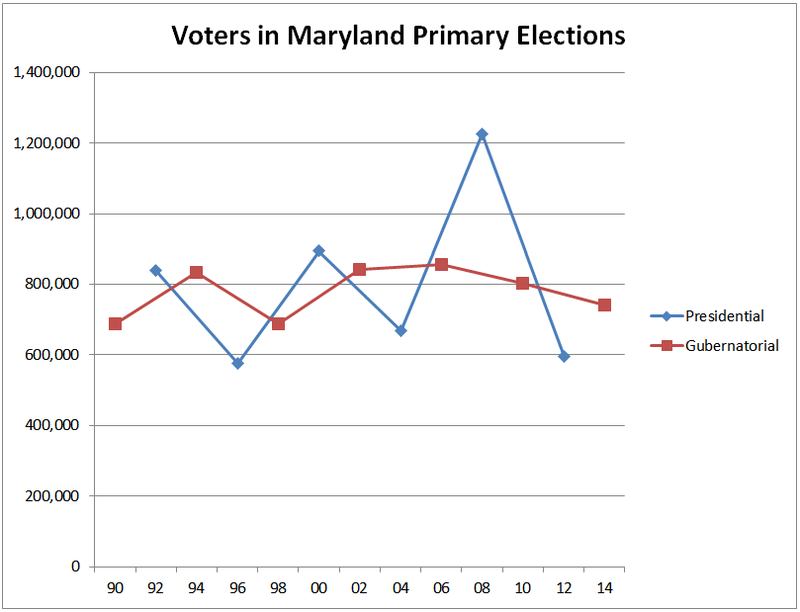 The graph below shows the total number of primary election voters in Maryland since the 1990 elections. These elections are very sensitive to the circumstances of offices on the ballot. At the gubernatorial level, primary voting peaked in 1994, 2002 and 2006. The former two years saw open Governor seats while the latter saw a rare competitive U.S. Senate race. Primary voting tanked in 1990 and 1998, when incumbent Democrat Governors were running for second terms. At the presidential level, primary voting surged in 2008 when Barack Obama was in a competitive race with Hillary Clinton. Primary voting fell dramatically in years when an incumbent President was on the ballot (1996, 2004 and 2012). These candidate dynamics overwhelmed any effects of increasing registrations. General elections see much steadier patterns of voting. 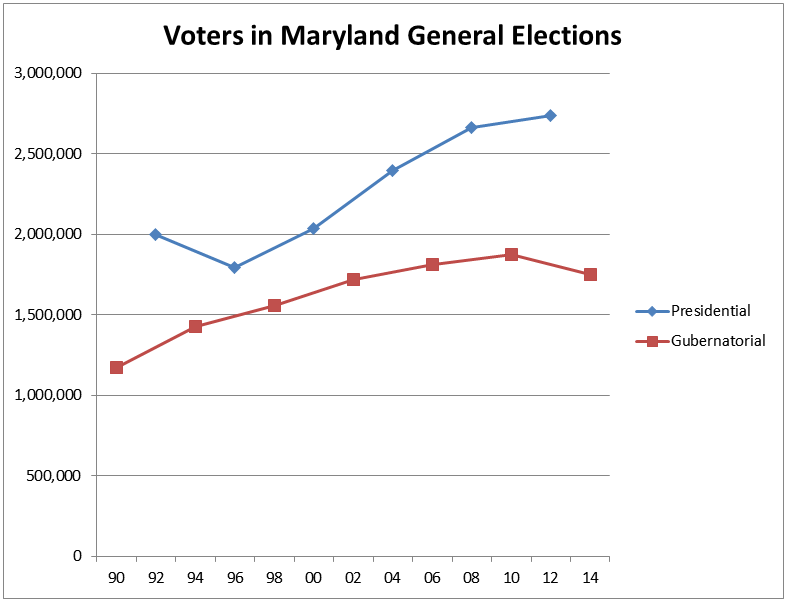 The graph below shows the total number of general election voters in Maryland since the 1990 elections. The absolute number of voters in both gubernatorial generals and presidential generals has been rising steadily since the 1990s – with the notable exception of a divergence in the 2010-2014 period. Presidential voting has gone up every year since 1996, but gubernatorial voting went down between 2010 and 2014. This is the same period during which early voting (2010), online registration (2012) and an increase in early voting days (2013) were implemented. Let’s look at this presidential vs. gubernatorial split more closely. The popularity of President Barack Obama may be a factor in increasing the number of voters in recent presidential elections. Obama gained 62% of the vote in Maryland in both 2008 and 2012 and his approval rating in Maryland has been above 50% for most of his time in office. 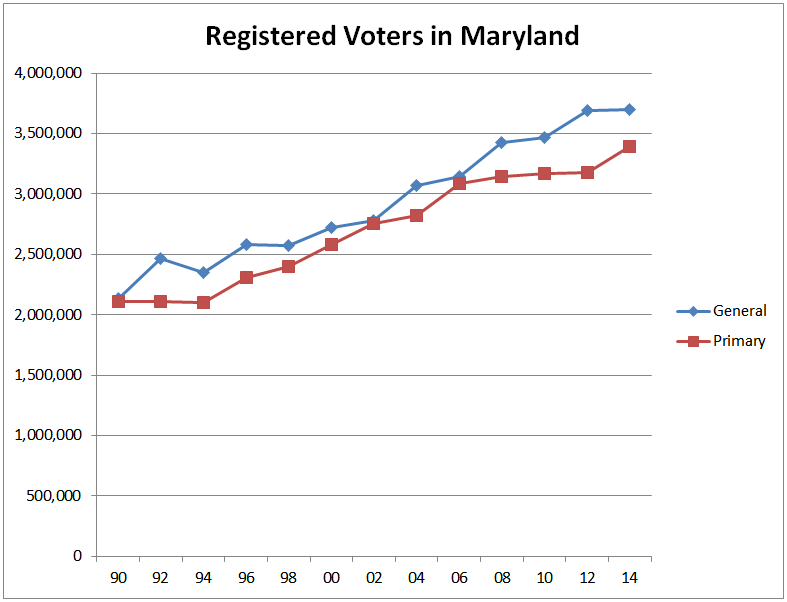 The chart below shows changes in registrations and voting for each Maryland jurisdiction between the 2004 and 2012 general elections. The two counties that gave Obama more than 80% of their vote in 2012 – Baltimore City and Prince George’s County – saw increases in both registrations and the number of actual voters greatly exceeding state averages. Counties opposing Obama saw rises in registration and voting too, but not nearly as much. The gubernatorial elections tell a very different story. The chart below shows changes in registrations and voting for each Maryland jurisdiction between the 2010 and 2014 general elections. Statewide, registrations were up by 7% while the number of voters fell by 7%. But voting behavior differed between counties supporting Larry Hogan and those supporting Anthony Brown. In the ten jurisdictions that gave Hogan 70% or more of their vote, the actual number of voters fell by 3%. In the four jurisdictions that supported Brown, the actual number of voters fell by 8%. Registrations rose by 7% for both groups. Increased registration has coincided with more voting in presidential elections and less voting in the 2014 gubernatorial election. Why is that happening? Here’s a theory: voters have access to much more information about presidential candidates than state or local candidates and are therefore more likely to vote for the former. In fact, state and local candidates target voters with long histories of regular voting with their mail and field programs while they ignore voters with sparse histories – including new voters. Declining local media coverage of state and local races reinforces this information gap. So the registration efforts of Democrats through legislation and party activities may help fortify the margins of presidential candidates and federal candidates running in presidential years, but they did not help the party in 2014. Not only did the Democratic nominee for Governor lose, but the Republicans picked up a record number of seats in the House of Delegates, captured the Howard County Executive seat and almost knocked off Congressman John Delaney – all while voter registration was rising. There’s nothing wrong with making voter registration more convenient. But given the above, there is little evidence to suggest that Democrats at the state and local level will significantly benefit from it. There is also little evidence that Republicans should fear it.